Yep, these are the same jeans that I wore in Monday's post. They're definitely my go-to pair at the moment and they also seem to go with just about every shoe I own. This time I paired them with my flowy white blouse (that I've had forever) and my thigh high boots. If there's one thing I've learned from buying clothing and shoes, it's to always make sure that what you're about to buy can be worn more than one way. It's all about versatility! 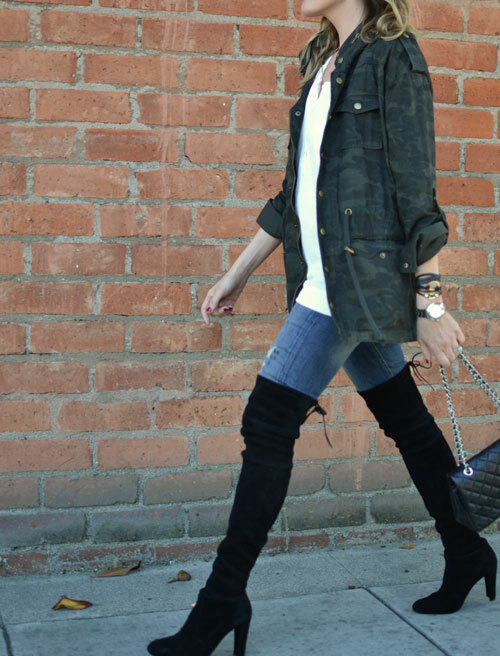 Love the boots and the camo jacket! The jeans fit so well on you. you look so gorgeous!!! those boots are amazing! Versatility is definitely key! And that's why I love denim so much lol!